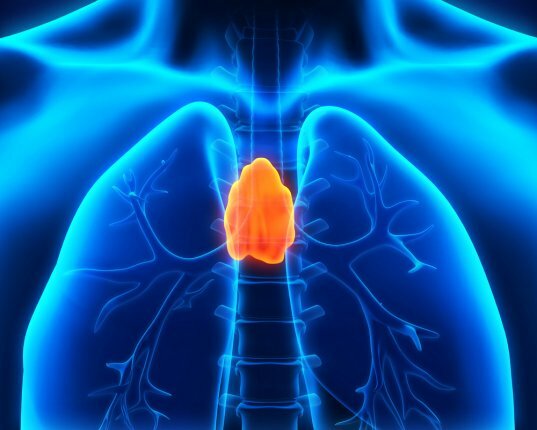 A thymoma is an uncommon tumor, best known for its association with the neuromuscular disorder myasthenia gravis Once diagnosed, thymomas may be removed surgically. A biopsy may be done before or during surgery (a mediastinoscopy or mediastinotomy), using a thin needle to remove a sample of cells. This is called a fine-needle aspiration (FNA) biopsy. Sometimes a wide needle is used to remove a sample of cells and this is called a core biopsy. If thymoma is diagnosed, the pathologist will determine the type of cancer cell in the tumor. There may be more than one type of cancer cell in a thymoma. The surgeon will decide if all or part of the tumor can be removed by surgery. In some cases, lymph nodes and other tissues may be removed as well. Chemotherapy may follow the surgical procedure.